In every area of business, digitalization has become an essential part of staying relevant. The same shift is happening in the healthcare industry, as we’ll be exploring through posts on this blog. Disruptive technologies will continue to push boundaries and change the way O.R. teams administer surgical care. A lot of trends are on the horizon, but which are here to stay? Check out our predictions below. The growing adoption of minimally invasive surgery (MIS) and advances made in imaging technologies meeting these new requirements in recent years have resulted in an increase in hybrid operating rooms. Together with a rise in surgeries performed worldwide—an estimated 61% increase in cardiothoracic procedures over the next 10 years in the US, for example1—the hybrid O.R. market is booming. The market is expected to grow at a compound annual growth rate of 15.42% over the next decade. Evidence-based medicine is based on data. One of the most valuable pieces of data collected during surgery are intraoperative scans. Therefore, intraoperative imaging devices (an essential component of hybrid O.R.s) are key to a more effective surgical procedure. But building a hybrid O.R. is often associated with high costs—upwards of $3 million USD—and large amounts of space required in the hospital. Most hybrid surgical suites today are at least 600 ft2 compared to the former standard of 400ft3. Mobile imaging devices—like C-arms, ultrasound devices and mobile CT scanners—are eliminating space issues, allowing for imaging in multiple O.R.s, even in different departments. Clinical use, however, still determines if a mobile imaging device can be considered. Technological advancements in image quality and separation of source and detector for more flexibility in placing the device in the room will contribute to expanding the number of clinical use cases in which mobile imaging devices can be used. The key to creating a sustainable hybrid O.R. at any budget is to choose a hybrid solution that has the ability to adapt with the changing needs and vision of the hospital, delivering the intra-operative image data performing the best result for the patient’s treatment. Today, most high-tech systems in the O.R. are touch-controlled. With new, touchless methods of software control being developed for every day devices, the future of the O.R. will also offer the surgical team new ways of interacting with devices and software. The sterile field in the O.R. is essential for protecting the patient from potentially life-threatening pathogens. Offering the surgeon the possibility to control devices and software without having to leave this field, keeping their hands free to operate on the patient, will have a huge impact on outcomes and patient safety. Existing touch-based technologies to address software within the sterile field include draped ceiling-mounted and handheld displays. In the near future, however, touchless solutions, like gesture recognition, eye tracking and speech control, will enter the O.R. Gesture recognition can be inefficient and even counterproductive, since it takes the surgeon’s hands away from the patient. Bright O.R. lights can interfere with the correct interpretation of hand movements. At this point, the variety of gestures as commands is limited and the technology as a whole still requires a lot of development. Addressing some of these potential issues is eye recognition, which quickly identifies the user’s field of view. While completely hands-free, this method is still fairly inaccurate and suffers from the “Midas Touch problem”: Involuntarily triggering actions by accidentally looking at the controls4. 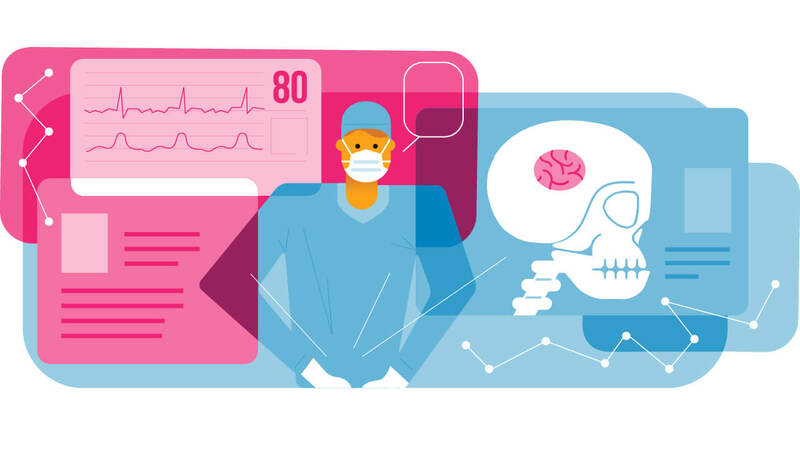 In terms of what methods of hands-free control will present the fewest problems in the surgical field, we believe speech recognition has huge potential to become a mainstay in the O.R. Through speech command, the surgeon can give orders, for example, to zoom in or out from a displayed view from across the room, to change the content showed in a display, to record a video, or to conference in a colleague outside of the operating room. Their usual surgical workflow wouldn’t be impacted, as it would be as if they were asking a nurse to perform the desired action. The technological challenge with speech control is to develop improved voice recognition software using more natural commands that also minimizes background noise to rule out false commands. More natural commands could also potentially increase system usage. Underuse is a problem we’ve observed with many of our customers: They have great technology, but it’s not being taken advantage of because the team doesn’t know how to use it. Simplifying the way the team interacts with their software could therefore also increase usage and streamline training. While Siri, Google Home and Amazon Alexa have made speech control an everyday reality for many, we believe that speech control will also play a significant role in the O.R. of the future. The age of digitalization offers many more opportunities for automatization than ever before. With the marriage of IT and operations technologies, intelligent devices are already totally transforming whole industry processes and business models. The hospital environment also has the potential to achieve a higher degree of automation. Surgical workflows especially, which are still made up of a wide range of mostly manual tasks, can gain enormously from automation. Sterile workflows in the operating rooms are, in fact, already being optimized by improved processes based on visual identification, for example, with Steri-ID trays that distribute sterile equipment to the right place at the right time. Patient data is also already be transmitted when needed before surgery even begins based on HL7 message standards. Even O.R. management is taking steps in this direction, with multiple vendors in the market working on tracking and automating processes for their workflow steps. Research institutes are thinking about how to automate workflows in an operating room as well, like OR.net, a collaborative project initiated by ICCAS institute at Leipzig University, Germany5. OR.net aims to build an open infrastructure by standardizing processes and opening it up to automation by using standard internet protocols, such as WSDL, SOAP, and XML Schema. So will we see a “Smart O.R.” in which self-learning devices work and sync autonomously anytime soon? In order to achieve this vision, it is crucial to take the first steps towards digitalization now, starting with hospital infrastructure to create the foundation for the operating room of the future. Internet Protocol (IP)—the way in which data is sent from one computer to another over the Internet—actually builds the foundation of all of the above listed “smart” developments. IP is being used more and more widely for voice and video over IP, but also for information exchange between devices, aka the “Internet of Things”. All devices’ sensors get an IP interface and are thereby connected to one IP hub. Devices form a whole network in which data is exchanged continuously in order to improve collaborative work. Using the open, standardized communication of such IP-networks can bring huge benefits to the hospital, like efficient data exchange to and from the O.R., the elimination of “cable spaghetti”, as well as the possibility to interconnect unlimited numbers of medical devices with just an IP address. Stay tuned for more about the world of IP in the O.R. in a future blog post! You might wonder why simplicity in the O.R. is a trend for us, as it should be obvious that this is something every industry should strive for. For us, simplicity ultimately leads to productivity and effectiveness. The goal of technology should be to simplify the way users work to achieve greater productivity. Unfortunately, this is not always the case. Taking all the above-mentioned trends into account, one can clearly see that complexity is also increasing. Setting up a digital O.R. environment with deep IT integration based on IP-solutions and implementing a Hybrid O.R. might seem overwhelming at first glance. But taking a deeper look into each of the four trends, it becomes clear that despite a high degree of complexity in the O.R., they all have the potential to simplify specific workflows. All IP-solutions achieve efficiency by simplifying data transfer and eliminating cumbersome service. Speech control enables simple device handling from the sterile field. Automated data transfer and O.R. management workflows will save time. Hybrid O.R.s, where surgical results can be verified intraoperatively and improved if needed, will help prevent complications and further hospital visits, therefore resulting in highly effective surgical procedures. Are you already experiencing the impact of these five trends in your operating room? Or do you plan on integrating these into your O.R. in the future? Let us know your thoughts by sending us an email at [email protected]. We’d love to hear from you! 2PR Newswire, 2017. Global Hybrid Operating Room Technology Market Analysis & Trends – Device (Surgical Imaging Displays, Operating Room Communication Systems, Intraoperative Diagnostic Devices and Surgical Booms), Application – Forecast to 2025. 4Hatscher, B. et al, 2017. GazeTap: Towards Hands-Free Interaction in the Operating Room. 19th International Conference on Multimodal Interaction (ICMI 2017). Berit focuses on product development for digital operating rooms. She enjoys helping to create new, innovative products to simplify documentation for the surgeon and provide them with just the right data in the O.R. In her free time, she backpacks around the world getting to know new cultures.